treadmill – Pump Those Crazy Legs! I finished up 2016 with 823km under my belt. My first full year of running, and quite the improvement over my 168km total for 2015! My longest single run for 2016 was 21.2km, and I clocked the most kilometres during March, April, and December – just over 100km in those months! The winter season arrived but that didn’t hold me back from continuing with my training. I had all my layers ready, and my best purchase ever was the IceSpikes I got for my shoes. Then for Christmas we got a treadmill – which was the best surprise ever! This allowed me to squeeze in quick runs at any time of day over the busy holiday season – and probably the only way I would have been able to keep up with my training over Christmas/New Years! Because I was able to keep up with my training, I decided to sign up for my first winter race in January: 10k at the Richmond Road Races. Never in my wildest dreams could I have imagined being able to PR my 10k time in the winter, but I did!! Such an amazing feeling! My training on the treadmill shows me running at a much slower pace than when I’m outside on the roads, despite the fact that it feels like a much harder workout. I sweat buckets working out on the treadmill! But all those indoor runs must’ve done some good after all. I don’t take 10:1 walking breaks on the treadmill, so I definitely noticed an improvement in my endurance, which may have been the key factor to my faster race time. 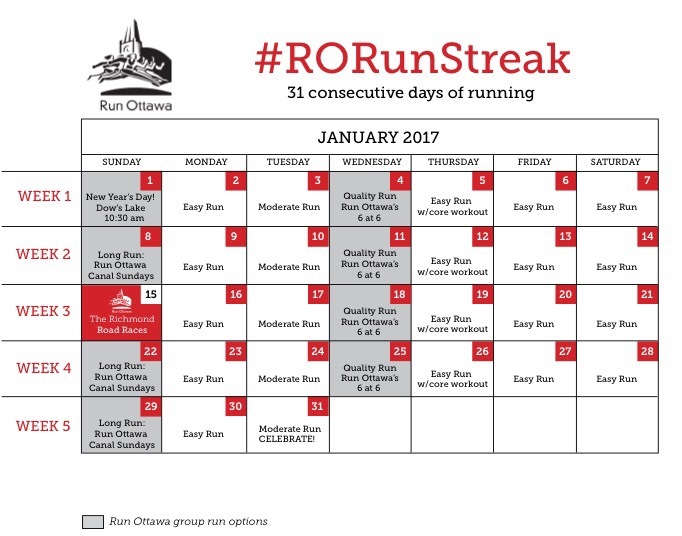 Another challenge that I decided to take part in was Run Ottawa’s January run streak, where we run every day for the entire month of January. Because I have the treadmill now, I knew hopping on for a quick 1 mile run those days in between training sessions would be easy for me. I amazed myself by being able to hang on to my running streak for those first three weeks ..but then was hit hard by an unexpected bout of depression. I could feel it coming on in the weeks prior, but because there was always so much going on I would try to distract myself with the next task or activity. And at night I would blast tv shows into my head until I fell asleep so that I didn’t have a chance to think too much and trigger that downwards spiral. Every morning I would wake up with a start, as if someone had sent a current of electricity through my heart. Just a pure jolt of anxiety to start my day. It was inevitable.. Each day I became more and more anxious and it became harder to repress. I stopped being able to sleep and even eat, and dropped a good 20 pounds in the span of a few weeks. Then one day I woke up with the darkest of thoughts swirling around in my head, and I knew I was done fighting. I had reached my absolute lowest point. The next couple of weeks are a blur for me as I immediately fell ill with a fever too, which lasted for a few days, then developed into bronchitis; lots of sleeping, lots of blasting sounds into my head so that I wouldn’t have the chance to think or feel. I went back on medication to help bring me back, but it didn’t feel like anything was helping this time around. I had never hit such a low like this before. And I was wracked with such guilt and shame because all I could do was sleep and lie in bed for days on end. I don’t know how many other runners out there also suffer from debilitating mental health issues.. How you manage it and how it impacts your training. But for me I was at the point where I was just done and couldn’t picture myself getting back into running ever again. Having just become a member of Run Ottawa’s Team Awesome, My Peak Challenge, and Oiselle Volée, I felt like I had failed and let everyone down. I had also signed up for the full marathon clinic at the Running Room and had already missed the first two weeks of training. I felt like I was in way over my head and should probably back out of everything. Fast forward to today and I’m doing a lot better than I was before. Though I’m taking on a whole lot less than I had been previously. Trying to keep myself from getting too overwhelmed; trying to stay stable. My life is very simple these days. I did venture out to join my marathon clinic for a run yesterday evening, however. I quite enjoyed the outing, though I still feel incredibly terrified by this challenge I’ve set for myself – marathon ready by June when I’ve only run a half marathon distance once?!? But I guess it doesn’t hurt to try and see how long I can keep up, while at the same time benefiting from the training. I feel my enthusiasm for running coming back, and so I’m just going to take things one day at a time.